The GlobeInvestor is reporting Even on Wall Street, capitalism takes a hit. Socialist-style Fed or financial saviour? 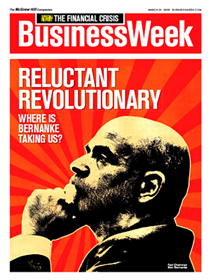 The cover of the latest issue of BusinessWeek shows Ben Bernanke in profile against a bright red and orange backdrop, pensively stroking his grey beard and looking remarkably like Vladimir Ilyich Lenin. The imagery is intentional and pointed. "Comrade Ben is determined that there will be no financial meltdown and no depression while he is in command," economist Ed Yardeni wrote to clients. "Given the initial reaction [on Wall Street], I suppose this means we are all financial socialists now." Guaranteeing Bear Stearns' portfolio of troubled investments sets a bad precedent by transferring potential losses from the market to taxpayers, complained Allan Meltzer, a professor of political economy at Pittsburgh's Carnegie Mellon University. "I do not believe the current system can remain if the bankers make the profits and the taxpayers share the losses." Fed Calls Regulatory Overhaul "Timely"
Reuters is reporting Treasury regulatory overhaul plan "timely". Upcoming Treasury Department proposals to make the Federal Reserve the chief regulator of U.S. financial markets and give it sweeping new powers won praise on Saturday from the central bank and the head of the Securities and Exchange Commission. "The Treasury's report presents a timely and thoughtful analysis and is an important first step in the complex task of modernizing our financial and regulatory architecture. We look forward to working with the Congress and others to help develop a policy framework that will enhance financial and economic stability," a Federal Reserve spokeswoman said. Let's Take a Look at "Timely"
There are $500 Trillion in derivatives that no one can possibly understand the financial risks on. A huge portion of those derivatives are with JP Morgan (JPM). Questions Linger Over Lehman's Balance Sheet as Lehman Brothers (LEH) is leveraged 31.7 times. Merrill Lynch needed $6.6 Billion Bailout From Kuwait, Mizuho. Morgan Stanley (MS) sold 9.9% of the firm to China after handing out huge bonuses. Businesses Are Advised To Walk Away from agreed upon deals. 1 in 10 of the entire state of Ohio is on food stamps. Florida, Ohio, and Michigan are in an economic depression. Unemployment is poised to soar. Commercial real estate is massively overbuilt and poised to plunge. Goldman Sachs (GS) is calling for another $460 billion in writedowns. The SEC Openly Invites Corporations To Lie. Gee, that sure looks "timely" to me. Who is to blame for the mess we are in? And who is to blame? The Fed course, with help of Congress, and the SEC. Congress passed legislation to create GSEs to foster affordable housing. Now the definition of "affordable" is over $700,000, and calls to reduce the role of the Fannie Mae are now calls to increase the role of Fannie Mae in the wake of the housing crisis. There were 300 some programs to create affordable housing and every program made the situation worse. All those programs really amounted to was handouts to the building industry and banks. And if Congress would stop wasting money on needless programs the dollar would stop sinking. Of course the government is wasting trillions of dollars trying to be the world's policeman, a role we can no longer afford. The SEC in its infinitely poor wisdom, decided to give government sponsorship to Moody's, Fitch, and the S&P and this led to extremely risky garbage being rated AAA. I talked about this problem in Time To Break Up The Credit Rating Cartel. But the Fed deserves the brunt of the blame for micro-managing interest rates like some central planners from the Soviet Union. The Fed does not know how to set the correct price for money (interest rates) any more than it knows how to set the correct price for orange juice. Only free market forces can properly set prices so that economic distortions do not occur. Unfortunately, every problem Greenspan faced was an excuse to cut interest rates. Even non-problems like the silly Y2K (year 2000) scare was an excuse to cut rates. When the dotcom bubble collapsed, the Fed slashed interest rates to 1% to get the economy moving again. The housing bubble was the result. Greenspan added more fuel to the fire along the way by openly praising ARMs and derivatives. Greenspan May 5th 2005: "Perhaps the clearest evidence of the perceived benefits that derivatives have provided is their continued spectacular growth." I compared Greenspan to Buffett in Who's Holding The Bag? Buffett in stark contrast to Greenspan called the explosive use of derivatives an "investment time bomb". It's perfectly clear now who was right. For those who have not pieced the story together properly, it was fear of a dominoes style chain reaction collapse of Credit Default Swaps starting with Bear Stearns that caused Bernanke to force a shotgun wedding between Bear Stearns and JP Morgan. So what does the Treasury Department propose? The Orwellian answer of course is to give the Fed still more power to wreak havoc. The New York Times is reporting In Treasury Plan, a Reluctant Eye Over Wall Street. The Bush administration is proposing the broadest overhaul of Wall Street regulation since the Great Depression. But the plan, to be unveiled on Monday, has its genesis in a yearlong effort to limit Washington’s role in the market. The regulatory umbrella created in the 1930s would grow wider, with power concentrated in fewer agencies. But that authority would be limited, doing virtually nothing to regulate the many new financial products whose unwise use has been a culprit in the current financial crisis. The plan hands vast new authority to the Federal Reserve, essentially formalizing what has been an improvised process over the last three weeks. But some fear that the central bank’s role in creating the current mess will undercut its ability to clean it up. The Fed’s former chairman, Alan Greenspan, for years praised the growth in the derivatives market as a boon for market stability, and resisted calls to use the Fed’s power to increase regulation of the mortgage market. The biggest, most reckless credit experiment in history has started to implode. It's far too late to stop a complete systemic collapse now. Granting new powers to the agency most responsible for the mess simply does not make any sense. In the long run, the only solution is to abolish the Fed, end government sponsorship of the ratings agencies, and return to sound monetary policies in Congress with a currency backed by hard assets instead of promises. Instead, the proposal is to give Fed increased authority to watch over additional henhouses. And if there's one thing worse than the fox watching the henhouse, it's the Fed watching the henhouse. A quick look at history should be enough to convince anyone of that.